Those who have visited Goa might be familiar with this famous Goan Recheado Masala. It's a typical Goan food especially used for fish fry. This is completely different from another the most popular Goan Rava Fish Fry recipe. On our recent visit to Goa, I got to meet one of my friend there and she prepared this Goan Recheado Mackerel fry for us. Though I was familiar with this dish, my hubby and son got to taste this for the first time. I was surprised to see my son finishing off two fish without any tantrums. Even my husband liked it. She was generous enough to lend me a bottle of freshly made Recheado Masala which she had to send it her Restaurant .She shared her recipe too even though I told her I would be further sharing it here in my blog. Love you my friend and thanks a ton for the recipe. 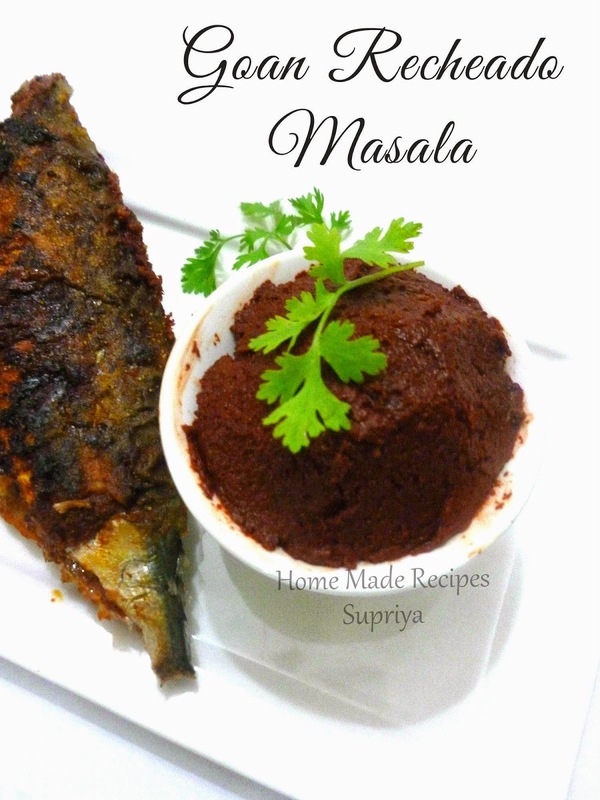 Recheado Masala is a sweet and tangy, fiery red colour fish masala used to fry fish. Since we add vinegar to this, masala stays longer. You can use it for months when stored in a refrigerator. Soak all these ingredients in vinegar for about 30 mins and grind it to a smooth paste. Make sure not to add water and also the mixer jar in which you grind the paste should be clean. Store this in a clean jar and use a dry spoon while using it. Note: Usually Toddy vinegar is used to make this Recheado Masala. You can substitute this with regular white vinegar too.